Bottle cages have been widely in use in the bikes for the convenience of the rider to carry the water, juices or other drinks. These cages are placed on the rear or on the frame of bike. The growing number of bicycle in various sports such as racing, mountaineering, and others has increased the scope for bottle cages. Bicycles are purchased for varied uses by different segment of people, but the bottle cages have its importance for every category of people having bicycle. In U.S., there were 133.6 million cyclists/bike riders, 85.0% of which equipped with bottle cages. High-end consumers are more tilted towards purchasing premium models of bicycle and a bottle cages equipped as an aesthetic. Goldstein Research analyst forecast that the global bottle cages market is expected to grow at a CAGR of 4.3% over the forecast years. The easy availability of raw materials, consumer preferences, number of bicycles, number of advanced bottles useful while biking and more are some of the factors that will grow the bottle cages market as per the forecast. On the basis of material, fiber reinforced material (FRM) has the largest market share of 36.8% in 2016 in global bottle cages market. FRM is lightweight material and keeps the total weight of the bike low especially for the bike racers and mountain climbers, is being majorly purchased as compared to other material bottle cages. Aerobar cages market is growing at a fast rate of 4.8% annually, being the convenient for the rider’s use as per the position and carrying space of the bottle cages. Bottle cages market outlook 2016-2024, has been prepared based on an in-depth market analysis from industry experts. 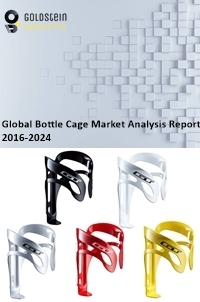 The report covers the competitive landscape and current position of major players in the bottle cages market. The report also includes porter’s five force model, SWOT analysis, company profiling, business strategies of market players and their business models. Global bottle cages market report also recognizes value chain analysis to understand the cost differentiation to provide competitive advantage to the existing and new entry players. There is a rising trend of old methods of losing and maintaining weight i.e. by bicycling. With the rising demand for bicycles to maintain the health, there is equally growth in the shipment of bottle cages in order to supplement the riders with water or energy drinks. In 2016, globally there were 1.9 billion overweight adults. 50% of the people working on their health are using bicycles. Further, the high application of FRM bottle cages is associated with high prices, making the product costlier than other types and becomes difficult for the manufacturers to readily opt for such options. Based on geography, North America had the largest stake in the global bottle cages market having 36.7% in 2016. Population in North America is more likely to adapt bicycles than cars due to the high cost of cars, instigating the high sales of bottle cages. In 2016, U.S. sales of bicycles was double than sales of cars. Europe bottle cages market has been growing at a rate of 3.6%, on the back of presence of maximum number of manufacturers in this region such as Giant UK. Global bottle cages market report comprises of the following companies as the key players in the bottle cages market: Elite s.r.l., XLAB, Giant UK, Essor USA, Blackburn, Lezyene, Pro-Lite, Campagnolo, Arundel. What is the revenue of global bottle cages market in 2015-16 and what would be the expected demand over the forecasted period?